Utilities can’t stop storms, but they can change how they plan and react. A few months after Superstorm Sandy slammed into the East Coast, a group of 60 experts gathered for a workshop to ask what went so wrong and where the opportunities to improve may be. The GridWise Alliance brought together the mix of utilities and vendors and other stakeholders to draft recommendations that should be considered not only by utilities, but also by state commissions and federal policymakers in order to be prepared for future storms. There are twenty recommendations in all, split into five overarching categories. The wording of the paper shows the critical shift that has happened as severe weather events have battered the nation, from wildfires last summer in the West to the derechos in the Mid-Atlantic to Sandy in the Northeast. The phrase "smart grid" is only used twice within the report, and it is put into both parentheses and quotes. The preferred term is "grid modernization," which many in the business have long argued is exactly what smart grid projects are. "Smart grid" may be out, but "resilience" is certainly in as the buzzword of 2013. It even appears in the title: Improving Grid Reliability and Resilience. Grid Modernization Technologies Can Prevent Outages and Decrease Projected Impacts. The first recommendation is a bit of a no-brainer, calling for state and federal policymakers to accelerate the integration of new and enhanced systems and sensors onto the grid for increased situational awareness. That must be combined with hardening of critical systems. To get there, the workshop recommended every state and/or utility should have grid modernization roadmaps that are updated regularly and defined by metrics that can be measured for accountability. “What we’re seeing is, until you start that conversation, things don’t happen,” said Becky Harrison, CEO of GridWise Alliance. GridWise is trying to bring that message to the upcoming meeting of the National Association of Regulatory Utility Commissioners. The average tenure of a state public utility commissioner is just three years, making education essential to get the ball rolling on significant grid modernization efforts. The last recommendation in the first section is the most insightful, but perhaps the most difficult to implement: regulators need to include societal costs in grid modernization business cases. Harrison noted that it will not be easy, but the Netherlands has done it. Enhanced Emergency Response Planning Processes Can Result in Better Deployment Coordination of Human and Other Resources. Advanced modeling is available and utilities and regional planners should be taking advantage of it. One idea that’s particularly interesting is the concept of a “storm infrastructure impact index,” which could inform officials and the public of the estimated impact of approaching storms. GridWise Alliance also calls for NIST to step in and develop interoperability standards for key utility systems, so crews from various utilities can work seamlessly together during disasters. Information and Communications Technologies (ICT) Infrastructures Should Be More Resilient, Reliable, and Secure. Not only does there need to be better coordination between electric crews before and during events, but also between telecommunications and utilities. In particular, workshop participants suggested that utility personnel should get first responder status to be able to access open communications lines. This conversation is already happening in Washington, according to Harrison. Systems, Capabilities, and Processes Can Be Leveraged to Improve Communications and Speed Restoration of Power. Many of the recommendations here fall under “use it if you got it,” from fully leveraging AMI networks to sensors on the grid that can provide situational awareness in a storm. The key is all of the networks communicate with each other. Although social media is everywhere, it is generally not fully integrated into utility systems. 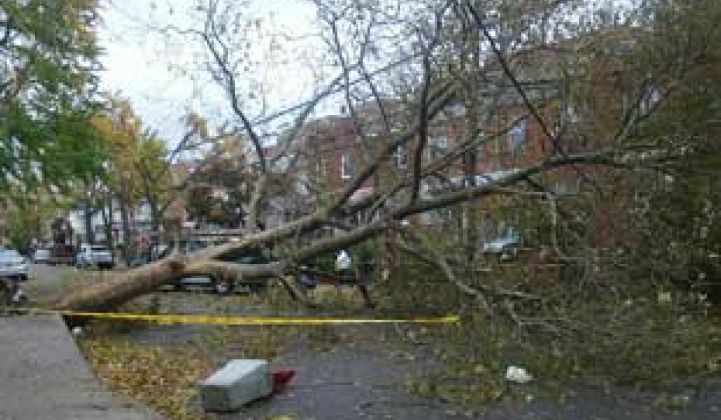 If someone tweets a picture of a downed wire, it should be incorporated automatically into an outage management system. Some utilities, like San Diego Gas & Electric, are moving toward that capability, but it is still early days. It doesn't have to just be pictures from customers, but could also include information from first responders or media crews that are out in the field.